The federal government today released the results of its public consultation on the legalization of pot and revealed its proposals for how recreational cannabis will be packaged and regulated. “Over the past two years we have consulted extensively on our plans to legalize, regulate and restrict access to cannabis,” MP Bill Blair, the federal government’s point man on pot legalization, told reporters Monday in the foyer of the House of Commons. 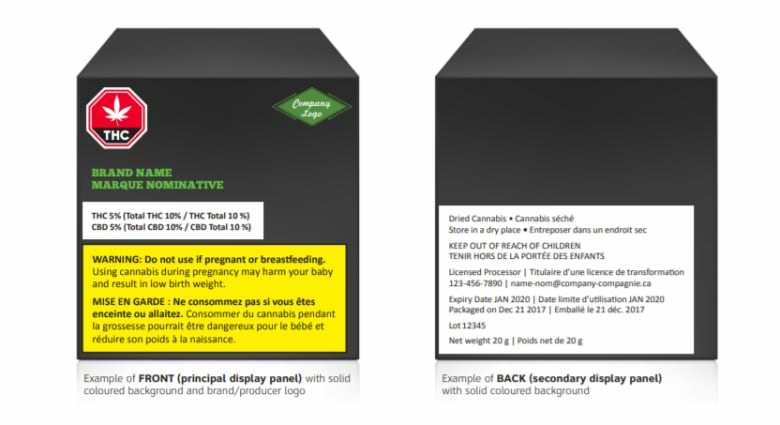 The Trudeau government’s proposals include restrictions on the colour of packaging and the depiction of branding, requirements for mandatory warning labels and a ban on packaging designed to appeal to young people. 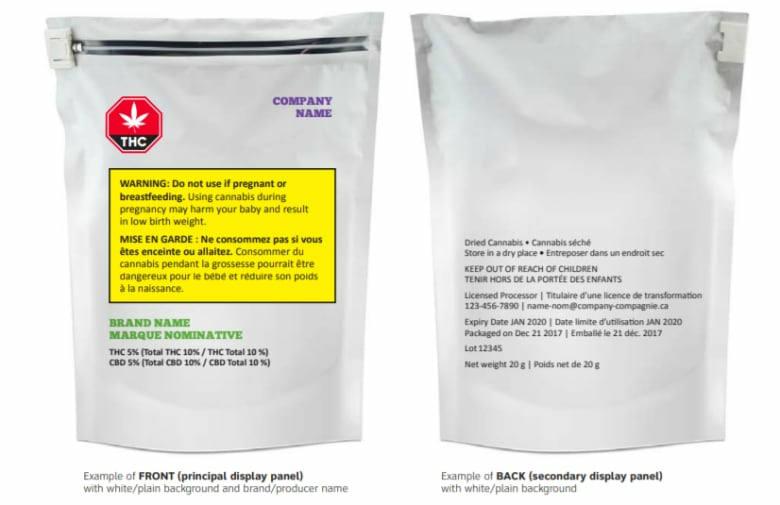 The regulations state cannabis packaging can’t display florescent or metallic colours and the colours that are used must contrast with those of the official cannabis symbol — meant to warn the consumer about the presence of marijuana’s active ingredients — and the yellow background of the Health Canada warnings. The proposed restrictions also stipulate that only one additional branding element – aside from the brand name itself – can be displayed on the tamper-proof and child-proof packaging. If that additional element is a slogan, the lettering can’t be bigger than the font of the health warning, while any logo must be the same size as, or smaller than, the standardized cannabis symbol. The federal government is also banning inserts inside the cannabis packages themselves — a rule meant to prevent producers and processors from getting around the limits on branding and marketing. “We have heard loud and clear from provinces and territories and also from stakeholders that they need to have this information regarding packaging as soon as possible,” said Petitpas Taylor. 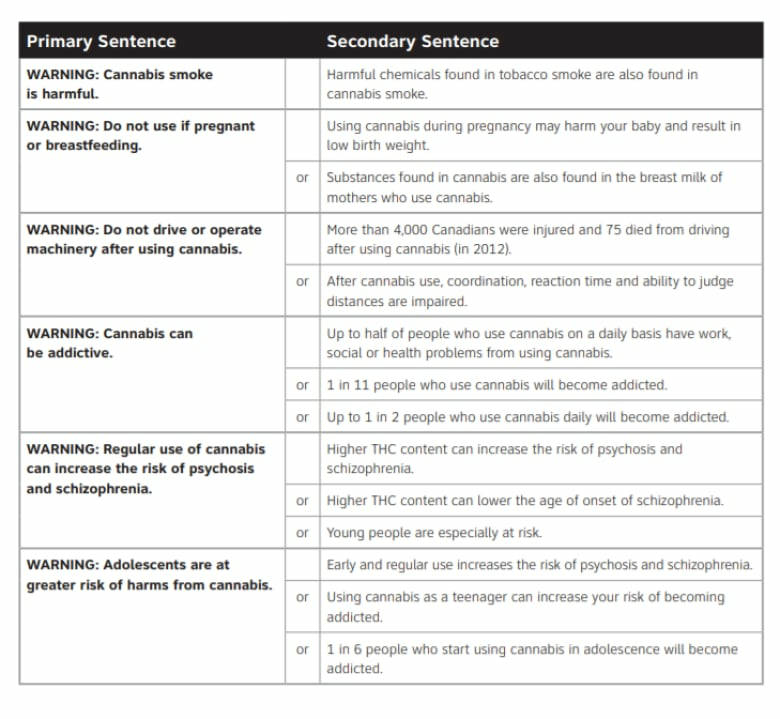 Those Health Canada labels including warnings about the risks regarding pregnancy, addiction, mental health, youth, and operating machinery or driving while under the influence of cannabis. “We also want to ensure that consumers are aware of the THC and the CBD levels that will be included in the cannabis product that they may choose to purchase. That’s the type of information that we feel is very, very important to Canadians,” said Petitpas Taylor. The proposed rules also outline how the federal government would regulate micro-cultivators and micro-processors. A micro-cultivator — someone growing pot on a small, boutique-like scale — would be restricted to a “plant canopy area” of no more than 200 square meters. Micro-processors would not be able to process any more than 600 kilograms of dried weed annually — which Health Canada says is about the total maximum production of a micro-producer. The micro-cultivation and processing limits, Health Canada said, were set to allow “small-scale growers and processors in the legal cannabis industry” to make their businesses viable without making them so small that the rules would drive producers into the black market to survive. David Robinson of the Craft Cannabis Association of B.C. said the size restrictions do not provide much room for small businesses to grow. The federal government reached out to Canadians through a series of in-person roundtables and online web-based discussions and received additional feedback through online and written submissions. In all, the federal government’s consultations received 3,218 online responses and 450 written submissions. Health Canada also saw 192 “interested parties” participate in roundtables and another 343 take part in online webinars. Four specific topics drew a large degree of interest from those who participated in the nationwide consultation. Growing outdoors on a commercial scale was widely supported, according to the government, although some concerns persisted about the risk of theft and the need to mitigate smell during the flowering season. Because the consultation paper did not contain any restrictions on how many licenses a micro-processor or micro-cultivator could hold at a single location, many expressed concerns that someone could skirt large-scale production rules by holding several micro-permits at once. In response Health Canada is considering restricting the number of licenses a single location can legally hold. The government also heard that Canadians worry that current financial regulations would make it easy for criminal organizations to craft complex financial structures to invest in the legal cannabis industry. The federal government said it will look into ways to increase financial transparency for producers and cultivators.